The Volvo V90 is a sporty and roomy crossover vehicle. The new V90 provides drivers with several performance-enhancing features, and these include powerful motors and low friction engine designs. The new Volvo V90 includes several power enhanced features under the hood. 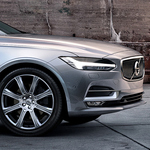 The V90 motor uses special direct fuel injection that maximizes power and minimizes waste. Included in this design is a proprietary turbocharger that directs high-pressure air into the cylinders, thus boosting power even more. These and other features result in a healthy 250hp and 258 foot-pounds of torque. In addition to the power generating features, the new Volvo V90 uses specialized friction reducing technologies to boost output yet more. These low friction systems include common rail direct fuel injection, specialized engine management, and low speed turbochargers. The low speed turbochargers allow the vehicle to provide plenty of power response when moving at slower speeds.